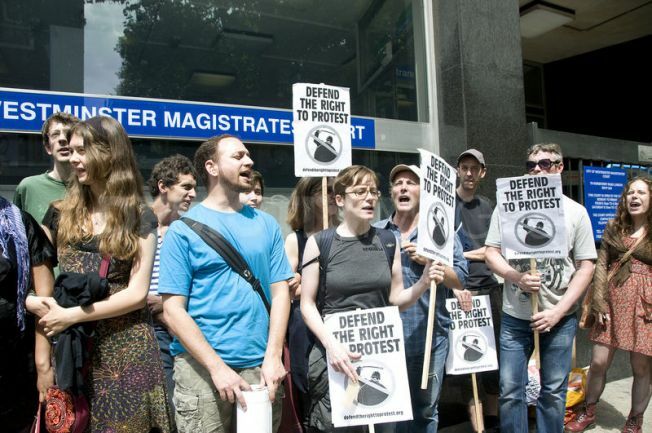 Following the mass arrest, activists claimed they had been “tricked”, as they said Clark had assured them that after leaving the store they would be directed to the nearest tube stations and free to go home. Their claims were backed by video footage obtained by the Guardian, which shows Clark denying that anyone would be kettled or detained after leaving the store. It was not known at the time whether Clark was aware that the activists would in fact be arrested. The Guardian can now reveal that the police admit deception in the lead-up to the mass arrest. Clark has confirmed she was told by her fellow commanding officers that everyone inside the building would be arrested. However, 10 minutes later at 5.50pm, Clark has admitted, she gave assurances to demonstrators that they would be allowed to leave unhindered. Thirty defendants are still up on charges of aggravated trespass – 13 people have already entered a plea of not guilty, the other 17 are up in court on Monday 25th July.